Today is the day, you guys! I have been so excited to show y’all the room makeover I’ve been slaving over lately! 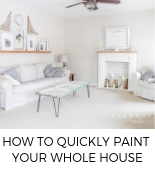 I have joined forces with my favorite fellow bloggers to encourage you to decorate a room in your home with a really thrifty budget of $100. 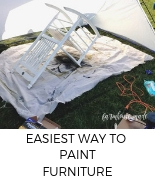 With such an affordable budget, we were all forced to use our creativity, DIY the projects, and really think outside the box with our materials and plan. 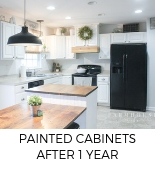 It’s amazing to see what rooms we all chose to makeover, renovate, redecorate, flip, refresh, or repurpose. 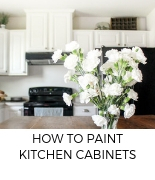 $100 is a budget that works for most people, so if you’re thinking of making an update in your home, I am certain you can find some inspiration on a tiny budget! 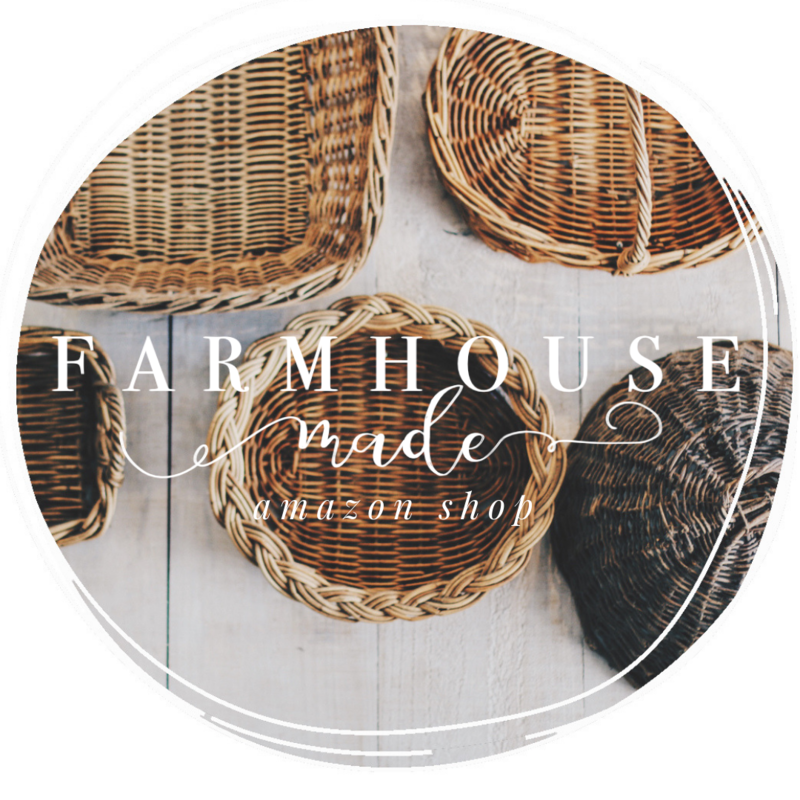 Allow me to set the scene for you and my project undertaking… My friends and I planned this project back in the summer, and decided on a deadline and budget – September 30; $100 with no sponsorships. Guess when I started my room? September 24th. I love a good challenge… but I also love procrastination. Because our house is builder-basic, this room is a beige square, with a beige floor, white tile, white vanity. Blah, blah. All I had in there was a shower curtain and the mirror for some color, alas this poor space had no identity. Actually, none of our bathrooms have an identity, but I wanted to start here because it’s small, and we knew we could do it in budget and have an amazing reveal. 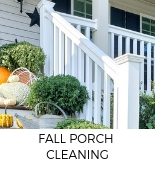 That, and I needed to address the fingerprint smudges on the non-washable builder beige flat paint we have no touch-up paint for (because we used it on their other finger prints). This is the light in our master bathroom (sad face), but the kid’s bathroom has the same light, just 2 bulbs. I took it off before I could get a decent photo of it. 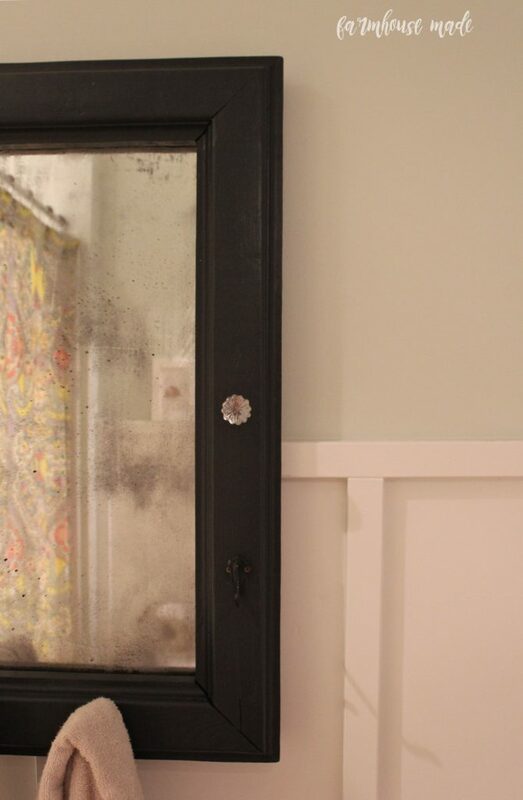 My original plan was to add board and batten, iron knobs and pulls, make a grain sack shower curtain, frame the mirror, and paint it all. Oh, and make that monstrosity into a gooseneck style barn light. 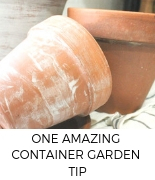 This post contains affiliate links, for your convenience. When you make a purchase through them, I earn a small commission at no cost to you. Tis what keeps this boat afloat, my friends! Read my full disclosure here. 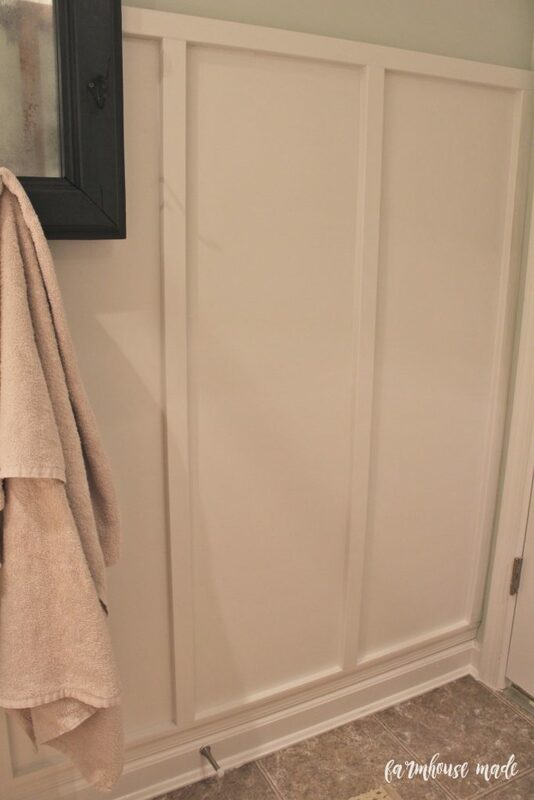 If you follow me on Instagram or Facebook, you’ll know that I posted a few sneak peeks of the room, and I am so excited to finally show you the entire bathroom! Board and batten and all the shiplapped things are my jam. Because this room takes a beating (3 kids, toothbrushes, toothpaste, bathies, soaps, and who else knows what, we went with board and batten for ease of cleanup. 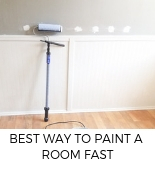 And it was so much faster to install than our shiplap hallway. After the install, I painted out the bottom and the trim, and definitely committed to painting the upper portion of the walls. That beige was so sleepy. 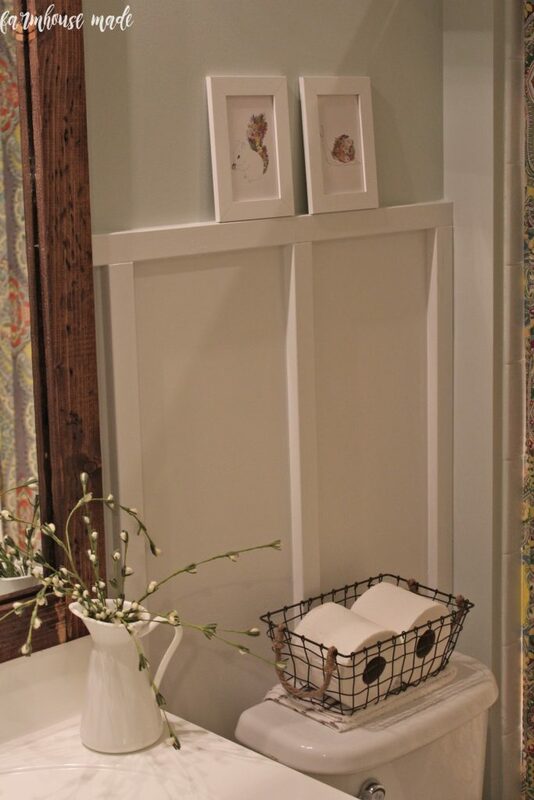 The wall color I went with is Filmy Green, which we got from Lowes from the HGTV Home by Sherwin Williams line. 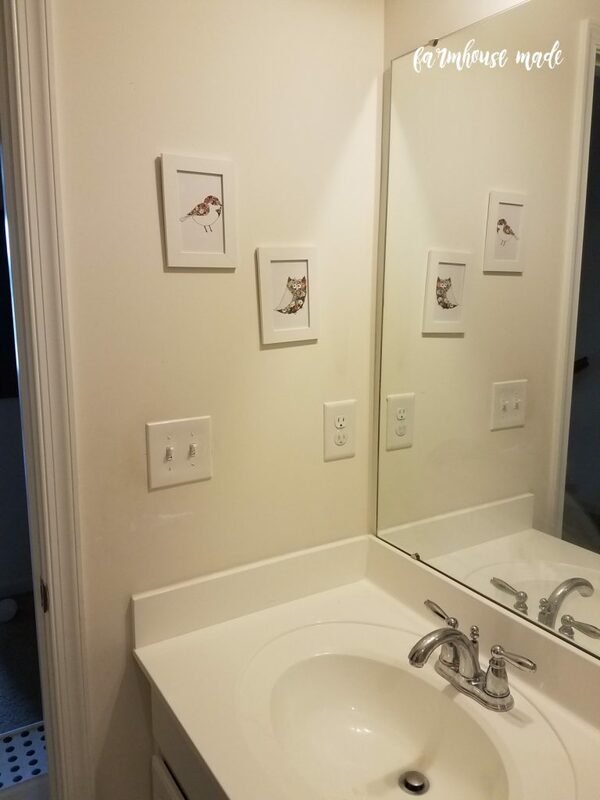 I ended up having absolutely no idea what color to paint the upper portion of the walls, so armed with two out of three kids, I chose the color pallet for the entire house, just so I could choose the bathroom paint. And I love it! 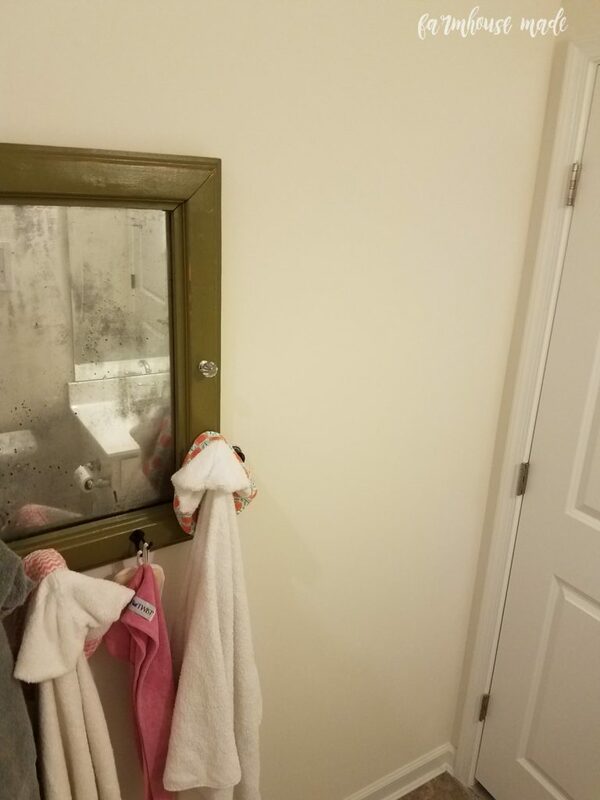 The black hooked mirror doubling as a towel rack is a project you may recognize from just a few weeks ago; he got a makeover. fter I finished painting the walls, I realized the green in that mirror clashed horribly with the beautiful green wall paint. 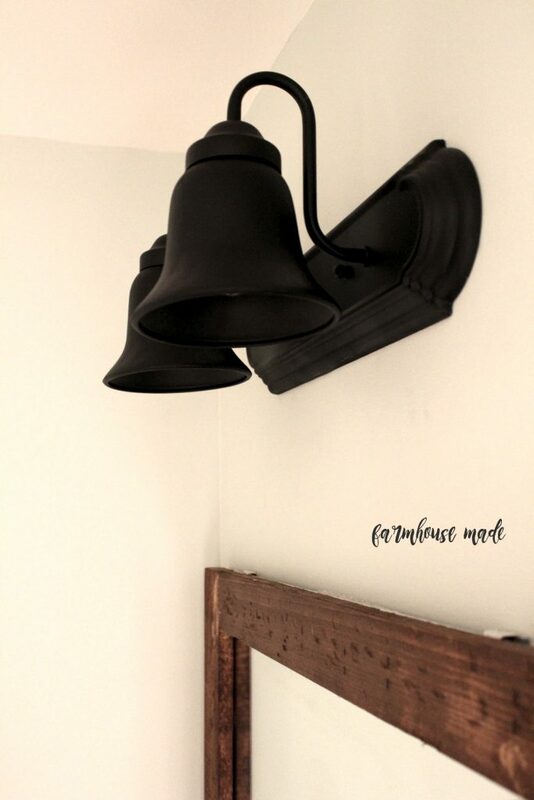 My go-to decorator friends thought black could work because the green was just tragic, and I think it looks amazing, while bringing out the iron-look hardware and black light fixture. The shower curtain I purchased 3 years ago from World Market and it is going to stay! I was going to make a shower curtain from a drop cloth at the last minute, but I do love the way the colors look now the whole room is pulled together. It shall be set in stone! 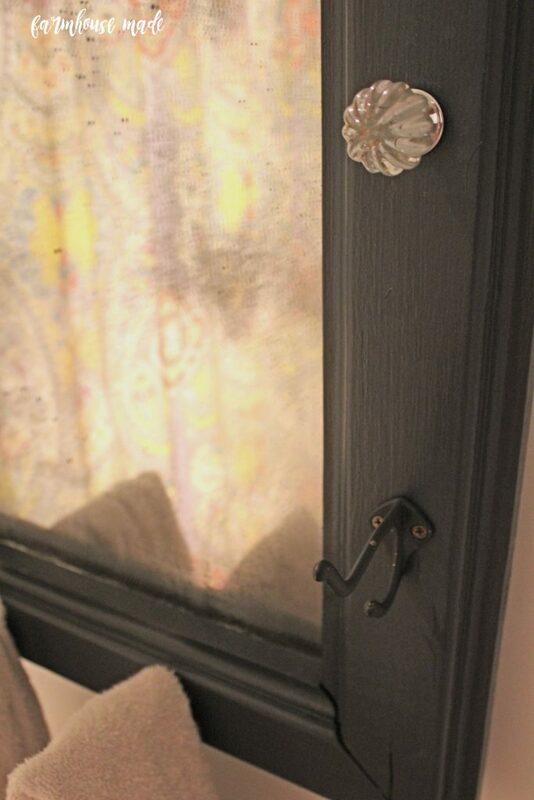 The knob and pulls are from Home Depot, and were a good fill-in for the super expensive ones elsewhere. This light, though! 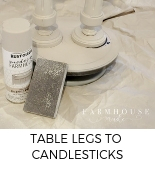 I have to tell you, my original plan was to spray the whole thing black and use jelly jars (we have those in the powder room) as the shades. Then I decided I wanted to find a bubble glass shade instead. 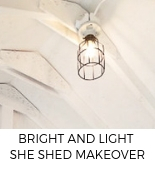 I couldn’t find one I loved enough, so I tried to knockoff a different barn-style light with tiny lamp shades. Nope. 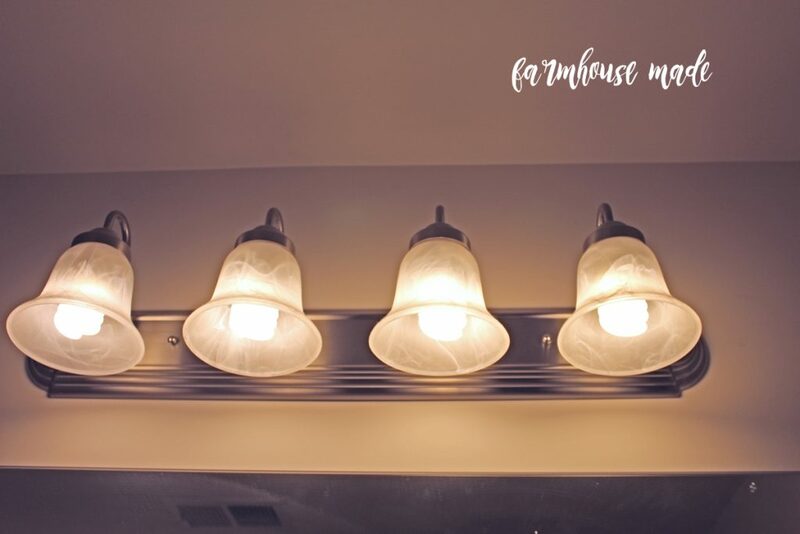 In the final push to meet the looming deadline, I decided to just paint the glass shades, and it turned out really adorable, if I do say so myself. For zero dollars! This mirror frame was rough cut pine and attached with mirror adhesive. We made this big ol’ thing the same way we made the map frames. Yahtzee! The ONE TIME I am under budget, y’all. The single time in the history of the world. Mark this date in your calendars! There is so much you can do with $100; I still had room in the budget, and will probably add a shelf or some cabinet storage organization, but for now… this room is done! Andrew said he wants to do the other two bathrooms next week. 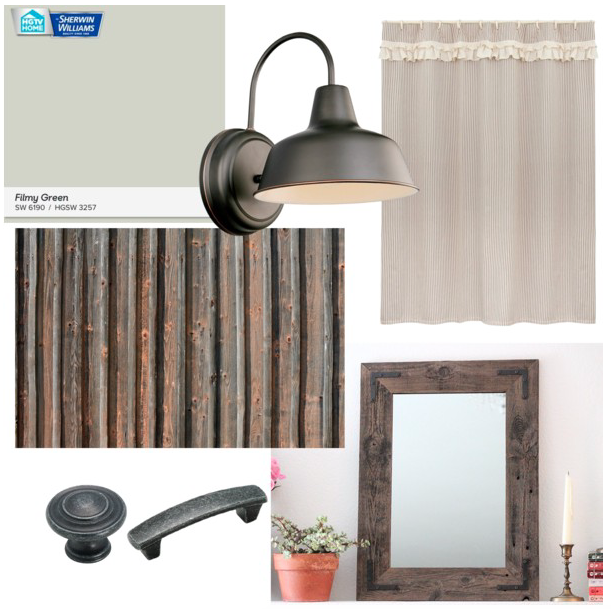 To see what other room makeover ideas the rest of our group came up with, start hopping! 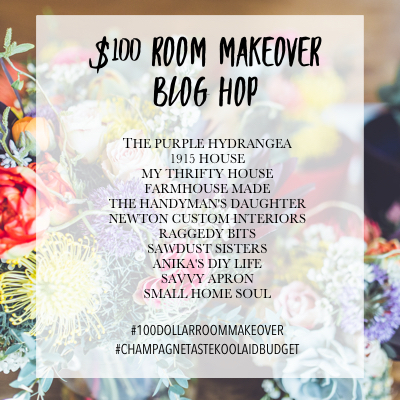 Follow #100dollarroommakeover and click the names below and start pinning, sharing, and getting inspired! I love how it turned out. The wall color and board and batten are fabulous! Dust yourself off friend! I also want B&B all over the place. 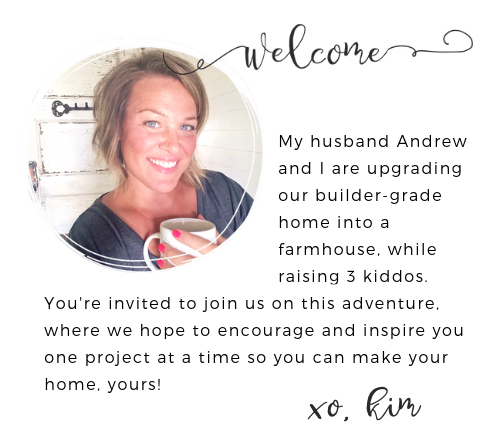 Between shiplap and B&B, I am going to lose my marbles! wow!! That board and batten is amazing!! 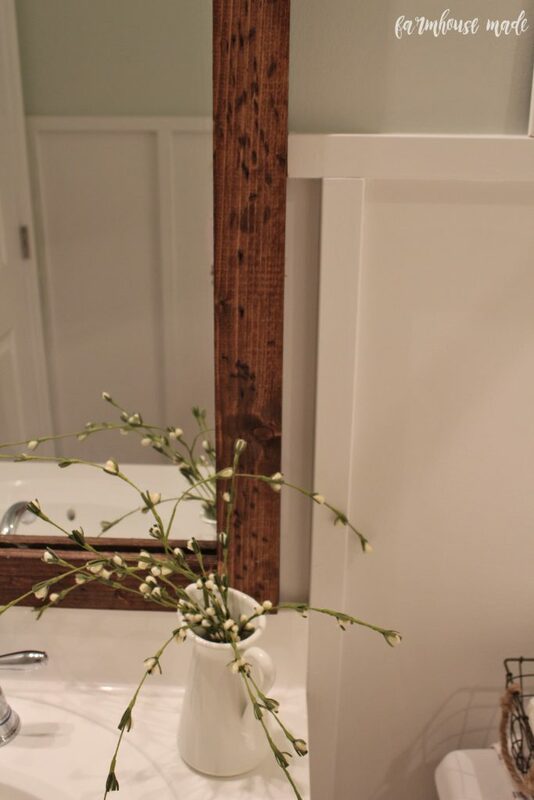 And the mirror with the hooks… so cool!! LOVE IT!!! The board and batten turned out lovely and the mirror frame is gorgeous, great job girl! You did a great job! Love the board and batten detail. It’s certainly not builder basic anymore! Girlfriend you just hit a home run. I seriously would be expecting a call from HGTV like any minute!!!! I love it all!!!!! Kim that board and batten was awe-mazing!!! 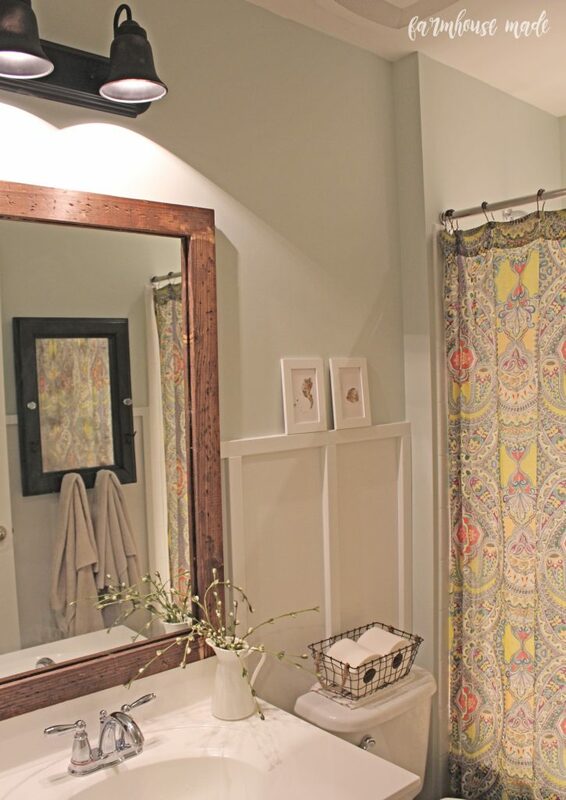 Your accessories are perfect, and I agree that shower curtain looks like new now that you re did the surroundings!!! Great job!!! Thanks friend! I’m so glad the shower curtain looks completely different in the space now! 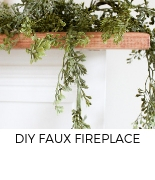 Okay, you have just sold me on board and batten for my hallway bath. It’s beautiful!! You did a great job!! Fabulous makeover Kim! Surely no builder basic now!! Love the board and batten! Totally changes the bathroom! 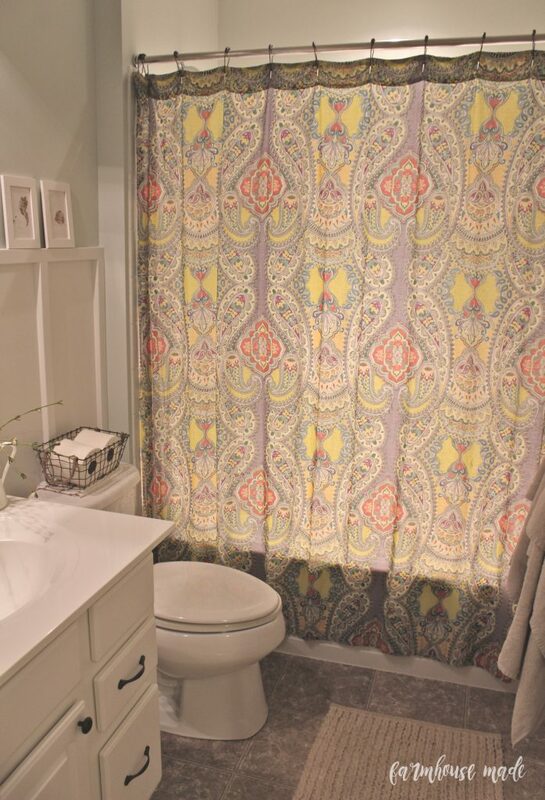 Love your shower curtain too! Awesomeness is all in this room! That’s an amazing transformation! Love all the touches you added. I’m sure your girls love it. Visiting from BOB Tribe. It looks amazing!!!!! Wow, what a transformation! Painting the light was genius! I love how this makeover turned out kim. 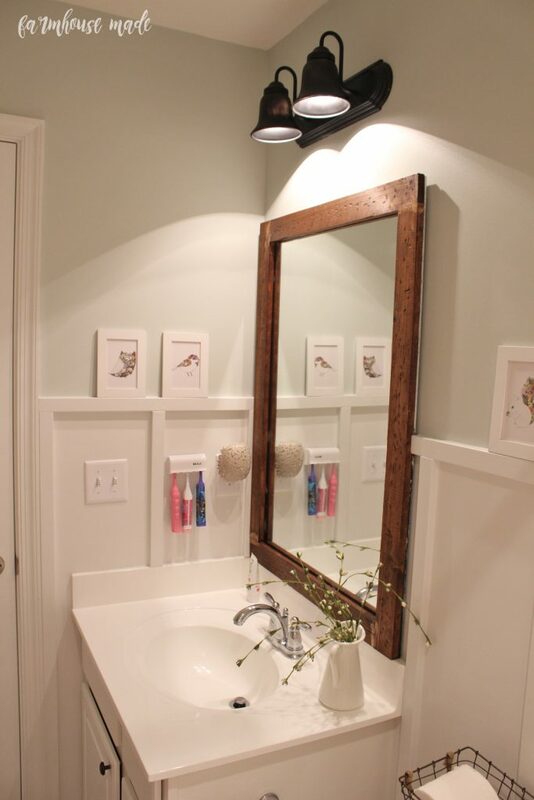 That rustic mirror really sets the tone for the bathroom and those shower curtains are gorgeous!